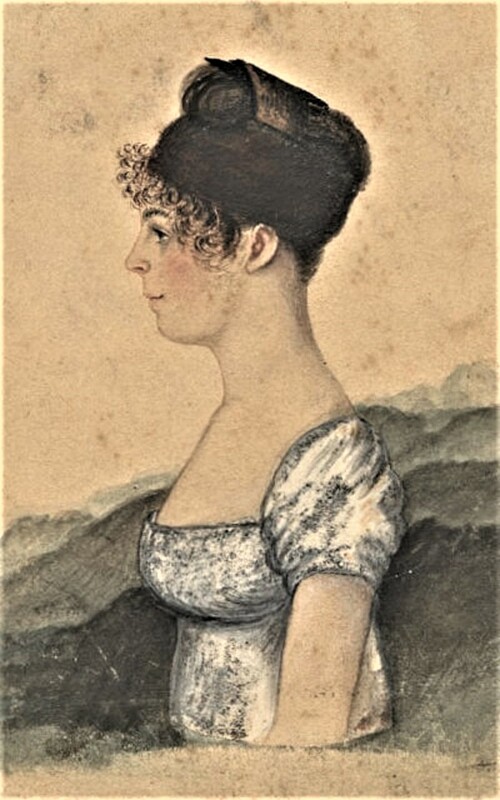 Susanna Haswell Rowson (1762-1824)This 1790s portrait is among the Susanna Rowson Papers, 1770-1879, Clifton Waller Barrett Library of American Literature, Albert and Shirley Small Special Collections Library, University of Virginia. Susanna Haswell Rowson (1762-1824) was a British-American novelist, poet, playwright, religious writer, stage actress, and educator. Rowson was the author of the 1791 novel Charlotte Temple, the most popular best-seller in American literature, until Harriet Beecher Stowe's Uncle Tom's Cabin was published in 1852. Susanna Haswell was born in Portsmouth, England, the only child of William Haswell, a lieutenant in the Royal Navy, by his 1st wife, Susanna Musgrave, daughter of a commissioner of customs. Other members of the Haswell family included 2 of Susanna’s 3 half brothers-Robert Haswell, an American naval officer & writer, & John Montresor Haswell, cited by congress for his bravery in the war with Tripoli, & her cousin Anthony Haswell, who came to Boston about 1770 & became a famous editor & balladeer in early Vermont. Since her mother had died in giving her birth, Susanna’s early rearing was entrusted to relatives. About 4 years after her birth, her father was assigned to duty in the revenue service in Massachusetts. There he married Rachel Woodward of George’s Island in Boston harbor & settled in nearby Nantasket. In 1768, Haswell returned to England for his daughter. In her partly autobiographical novel, Rebecca, of Fille de Chambre (1792), Susanna recounted the hazards of her voyage to America, ending in shipwreck on an island in Boston harbor & then the contrasting years of peaceful & simple pleasures of life at Nantasket. The Haswell’s circulated easily in the literate & stable aristocracy of the Boston area & enjoyed the best of life in the New World. Susanna’s precocious knowledge of the classics at the age of 12 is said to have impelled their eminent summer neighbor James Otis, to call her “my little scholar.” But the quiet harmony of their life was soon shattered by the Revolution. Applying for permission to leave American in the fall of 1775, Haswell (a member of the hated revenue service) was denied his request. His property was confiscated, & he & his family were interned as loyalists. After being held at Hingham for 2 years, they were moved in the fall of 1777 to Abington. Finally, in the spring of 1778, Haswell was permitted, on giving his parole to Gen. William Heath, to take his family to Halifax, Nova Scotia, & then to London, where they lived in poverty because of a several years’ delay in the granting of Haswell government pension. Susanna began job-hunting at once & soon became governess to the children of the Duchess of Devonshire. In this role she not only toured Europe but also saw something of the private lives of the aristocracy, which she later used as material for her fiction. In 1786, she published her 1st novel, Victoria, with a dedication to the Duchess. She then retired from her job to marry, in 1787, William Rowson, a hardware merchant & a trumpeter in the Royal Horse Guards. A handsome, sociable man, too fond of liquor, too trusting in business enterprises, &father of an illegitimate child, Rowson was not an ideal husband. There can be little doubt that certain of the trials of female patience recounted in Mrs. Rowson’s major novel, Charlotte Temple (1791), had some foundation in her own life. With the failure of Rowson’s hardware business in 1792, both husband & wife took to the stage, playing in Edinburgh in 1792-93. There they were booked by Thomas Wignell to act in his company in the new Chestnut Street Theatre in Philadelphia.She & her husband accepted Wignell’s offer sailing to Philadelphia aboard the George Barclay later that summer. She remained with Wignell’s company until the fall of 1796, when she left to join the Federal Street Theatre in Boston, where she spent one season before retiring from the stage to embark on a teaching career. The Old Chestnut Street Theatre, Historical Society of Pennsylvania. 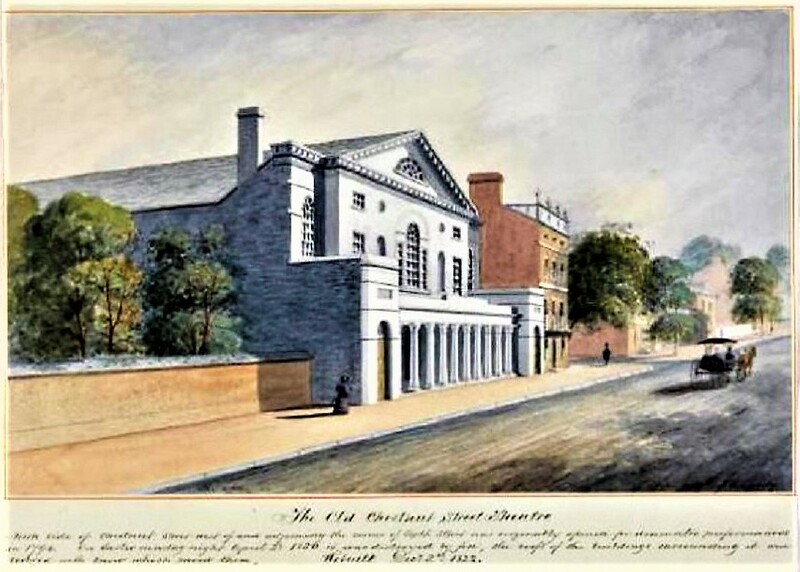 The New Theatre on Chestnut Street, opened in 1794, was where Susanna Rowson performed during her time in Philadelphia between 1794-1796. She wrote several of the plays she acted in, including Slaves in Algiers; or, a Struggle for Freedom in 1794. After performing in Annapolis, Philadelphia, & Baltimore, in 1796, the Rowsons settled in Boston to play at the Federal Street Theatre. Although not a gifted actress, Mrs. Rowson had a warm personality & versatile talents; she could dance, sing, play the harpsichord & guitar, write plays, & compose both lyrics & librettos. During her 5-year career in the theatre she acted 129 different parts in 126 different productions, a number of them written by herself, & some with the collaboration of musicians such as Alexander Reinagle of Philadelphia. The most successful of her theatrical works was the operetta Slaves in Algiers, or a Struggle for Freedom (1794), in which a group of American women, captured by North African pirates & held for ransom, eventually make their escape. Other of her plays were The Volunteers (1795), a musical farce based on the Whiskey Rebellion; the comedic melodrama The Female Patriot; or, Nature’s Rights (1795); The American Tar, or the Press Gang Defeated (1796): & Americans in England, or Lessons for Daughters, a 3-act comedy, 1st presented in 1797, in which she made her last appearance. In the spring of that year, now in her mid-30s, Mrs. Rowson retired from the stage opening a Young Ladies Academy in Boston. She moved it in 1800 to Medford, in 1803 to Newton, & in 1811 back to Boston, where until her retirement in 1822 she occupied quarters on Hollis Street. One of the 1st schools established in the United States to offer girls some education above the elementary level, the academy was highly successful. Mrs. Rowson wrote some of her own textbooks, including An Abridgement of Universal Geography, together with Sketches of History (1805? ), A Spelling Dictionary (1807), & Biblical dialogues between a Father & His Family (1822). The school was also unusual in offering its young women formal instruction in public speaking & in providing well-qualified music teachers trained in Europe. In other contributions to Boston’s cultural life, William Rowson played a memorable trumpet in the Handel & Hayden Society’s performances of the Messiah, while Mrs. Rowson, who counted among her friends such as leading musicians as the Graupners & Von Hagens, helped organize concerts. When the Boston Weekly Magazine was begun in 1802. Mrs. Rowson became a contributor, as she was to the Monthly Anthology & Joseph T. Buckingham’s New England Galaxy. She had meanwhile published other ventures in the field of the novel, among them Trials of the Human Heart (1795), a rather loosely organized 4-volume work to which both Benjamin Franklin & Martha Washington were subscribers, Reuben & Rachel (1798), a rambling historical novel dealing with the heirs of Columbus. Sarah, the Exemplary Wife, a series of fictionalized moral tracts first published in her Boston Weekly Magazine, appeared in 1813. Varied as were Mrs. Rowson’s activities, her main importance is as the author of one book - Charlotte Temple (London 1791; Philadelphia, 1794), the 1st American best seller, which has seen over 200 editions to date. (She also wrote a sequel, Charlotte’s Daughter; or, The Three Orphans, published posthumously in Boston in 1828.) A sentimental novel patterned on the standard seduction story, Charlotte Temple tells of a sheltered English schoolgirl possessed of more tenderness than prudence who is seduced, carried off to New York, & abandoned by a British army officer whose villainy is punished, after Charlotte’s death, by the torments of remorse. 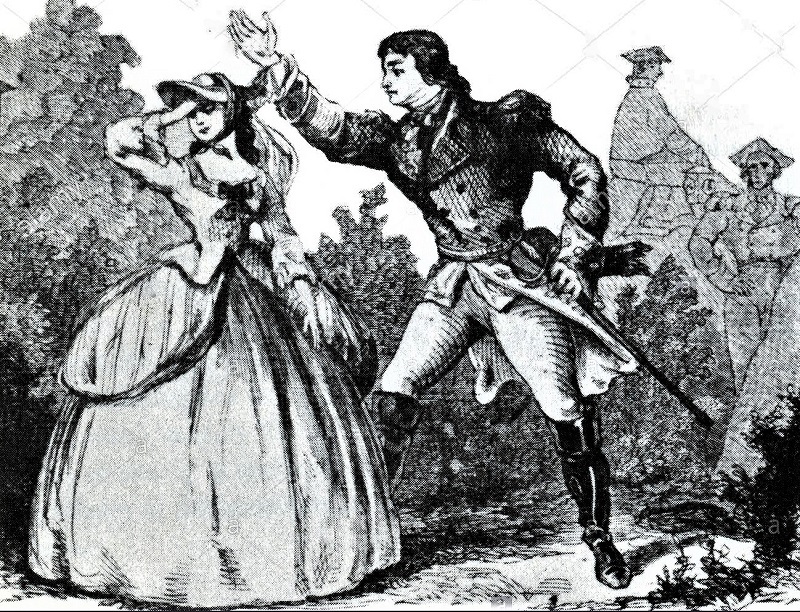 The subtitle of the book, “A Tale of Truth,” may well be correct, for some evidence exists that the original of the seducer, Montraville, was Mrs. Rowson’s cousin, Col. John Montresor. Like many best sellers, Charlotte Temple is more significant for the historian of popular taste than for the literary critic. Although hinting at the power of the sexual impulse & detailing the penalties meted out to women for accepting illicit love under the “double standard” may well have been a useful part of the education of a young girl. Although Mrs. Rowson had no children, her household was large, for it included her husband’s younger sister, Charlotte; his illegitimate son William; her own niece, Susan Johnston; & her adopted daughter, Fanny Mills. To these last 2 she turned over her school in 1822, though she apparently still maintained much of the alertness & vivacity that had marked all her life. Mrs. Rowson regularly attended the preaching of the Rev. John S. Gardiner at Trinity Church, & found scope for expressing her humanitarian convictions by serving for some years as president of the Boston Fatherless & Widows’ Society. She died at her home in Boston & was buried in the family vault of her friend Gottlieb Graupner in St. Matthew’s Church, South Boston. When this church was demolished in 1866, her remains were transferred to Mount hope Cemetery in Dorchester. Reared in a loyalist family, Mrs. Rowson became an ardent, articulate American patriot. An active proponent of the theatrical & musical arts in the early years of the United States, a broad-minded & effective teacher, she was also one of the 1st to express, through her writings, a subtle protest against the dependent status of women in her day.